Day 500 / Hat 500: Red, handmade alpine-style hat in soft felt with red thread stitching and accessorized with a single white turkey feather. Handcrafted late last night by this mad hatter himself to approximate the hat worn by one Bartholemew Cubbins in the book that bears his name. step up to the plate and actually make one. I'm not so handy with the needle and thread (in some places it was augmented with a generous application of double-sided craft tape), but as I sat there at my desk stitching this together I gained a true appreciation for the art and craft that in the course of wearing my work hat I often overlook. As to that last point, I'm referring specifically to the young lady I told you about back at PC 481 who told her mom, in the early days of the Project, that she wasn't sure I'd hit 500. She sure lit a fire under me. And, wouldn't you know it, by a strange twist of fate, that little girl turns 10 years (or roughly 3,650 hats) old TODAY! I know any list of thank-yous, appreciations and hat tips would fall short -- which is why I tried to thank folks as I went along, but an especially deep bow of thanks goes to my long-suffering colleagues who have watched the tide of hats ebb and flow across my desk over the last year and a half. Thanks too to my family (nuclear/extended/by birth and marriage) for their unflagging support and enthusiasm. And a simultaneous tipping of all 500 hats is due the Bride. Purchaser of some hats, loaner of others, in the final moments of last night's labors she even served as millinery midwife as I birthed the final Bartholemew bonnet. Oh, and if you haven't read Dr. Seuss' "The 500 Hats of Bartholemew Cubbins," you should. There's a lot going on in there. Even after many a re-reading I'm still finding magic beneath every last hat. I did what I did for that kid from the Kingdom of Didd. Video: "The Road to 500"
Q: OK, nice hat -- but what exactly is Project Cubbins, anyway? 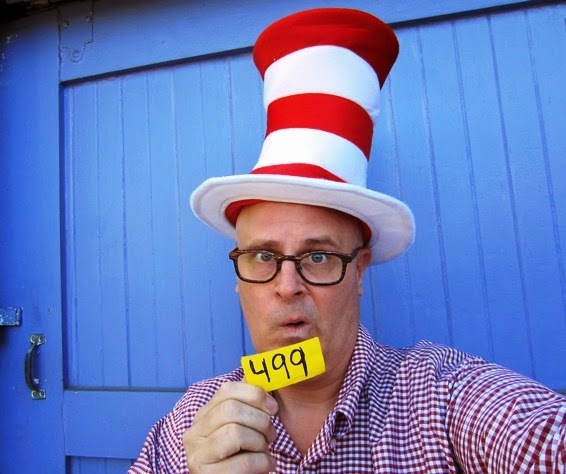 A: One man's homage to Dr. Seuss and his second book, "The 500 Hats of Bartholemew Cubbins," which celebrated the 75th anniversary of its publication in 2013, Project Cubbins is an attempt to document the wearing of a different hat or piece of headgear every day for 500 consecutive days. No do-aheads, no banking of hats, no retroactive entries. PC started on May 27, 2013 with Hat 1. Day 499 / Hat 499: Plush red and white striped stovepipe-style top hat with 11-inch crown, inch-and-a-half white brim, red lining and interior adjustable Velcro sizing strap. One interior tag reads: "Dr. Seuss, 2014 Classic Media, 59 cm, made in China," and second tag reads: "Spirit Halloween, Egg Harbor Township, NJ, USA, 100% polyester." According to the hang tag that was attached to this bad boy when I bought it at the UTB Spirit Halloween store, it is an officially licensed "Cat in the Hat Deluxe Hat." With the sun speedily setting on the Project, I felt it only appropriate for the penultimate piece, to pay homage to undoubtedly the most famous of all Seussian hats from the book "The Cat in the Hat" that catapulted (did you see what I just did there?) Dr. Seuss (aka Theodor Geisel) into literary fame in the years following its March 12, 1957, publication. 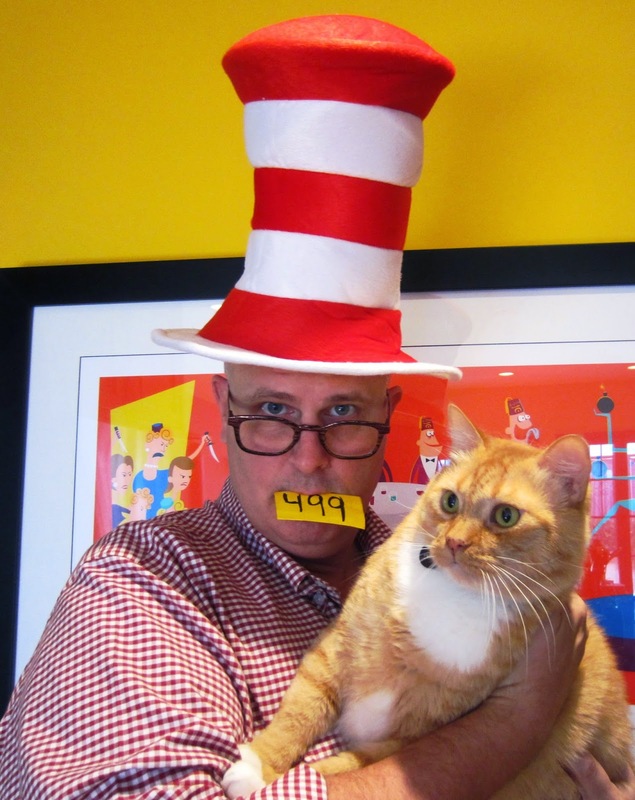 As an added bit of fun-time wordplay (look, I've only got so much slack left in the rope here folks) I had the Bride take a second shot of me in the "Cat in the Hat" hat - with our cat. The furry loaf of sunshine in my arms there is Bob and while, he was certainly not amused by the whole affair, at least he held still long enough to get the shot. Of course our other cat Citrus (aka "Butterscotch Lightning") has had her own star turn over the course of the Project -- guest starring in the more than appropriately titled PC 274: "My Cat on my Hat." Comes to an end on the morrow. 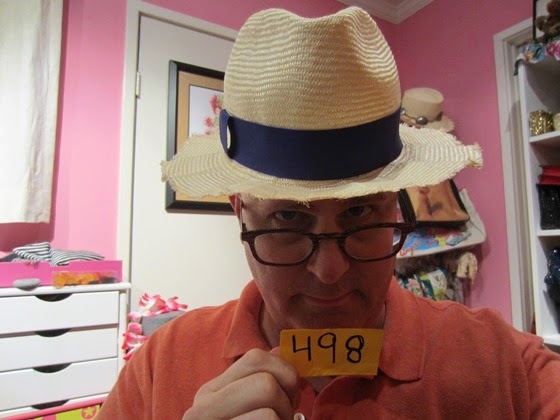 Day 498 / Hat 498: White, woven straw fedora with subtly geometrically pleated unfinished brim, blue grosgrain ribbon hatband detail and brown interior sweatband lining. Interior tags read: "Thakoon" and "Albertus." That would as in Albertus Q. Swanepoel the South African born milliner and frequent collaborator with sells his own label as well as not infrequent collaborations with other fashion designers (such as Thakoon in the above confection). How could it have survived this long? I know not. What I do know is that I've searched high and low across the many entries over the last year and a half and don't see it recorded, logged or cataloged anywhere. It'd be unconscionable if I were to let a lid living in my own home escape my clutches. So, with this natty Thakoon lid locked down, that means thee are just two last hats to throw into the ring. 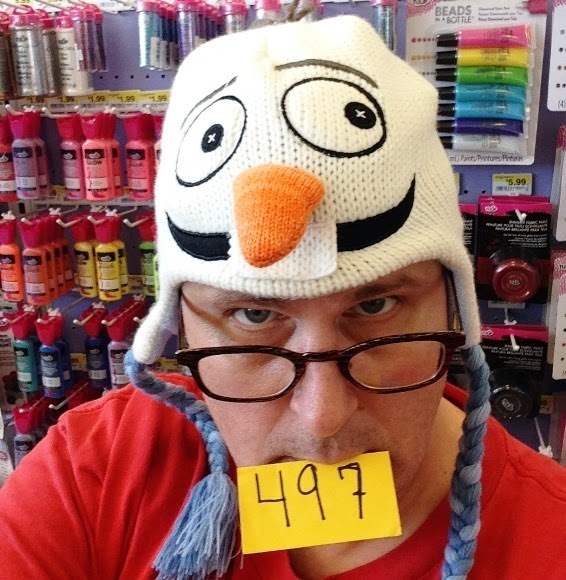 Day 497 / Hat 497: White, child-sized, knit Laplander cap with black embroidery detail and orange knit carrot nose on front that combine to create the grinning visage of Olaf the Snowman from Disney's "Frozen." additional detail includes baby blue polar fleece lining and braided light blue flap ties. One interior tag reads: "Disney, made in China," a second tag describes it as a "child 4-6X" and includes the name of the licensee as "ABG Accessories." At any rate, coming across this cartoon snowdude cap helped me keep a cool head in this record bout of Los Angeles heat we're having this weekend. It also helped the snowball of this Project to gain a little last-minute momentum as it rolls down the snowy slope toward conclusion just three days -- and three little hats -- away. Day 496/ Hat 496: Crocheted rasta-style cap in red, green, gold and black with attached faux dreadlocks that fall over the left and right shoulder. "Stop ya complainin' and go show ya ragamuffin' style! Strut your stuff in this Dreadlock Wig! Our Rasta Dreadlock Wig with Tam features an oversized tam cap with attached faux dreadlocks. Dreadlock Wig is made of 100% synthetic black fiber. Wig cap recommended for best use (sold separately). 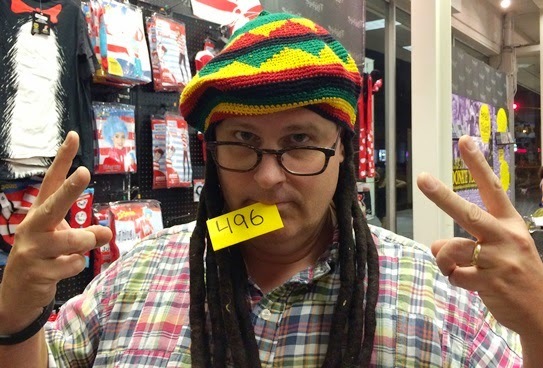 One size Rasta Dreadlock Wig fits most teens and adults." I may be almost to 500 hats but I'm not there yet and I'm still learning stuff along the way. 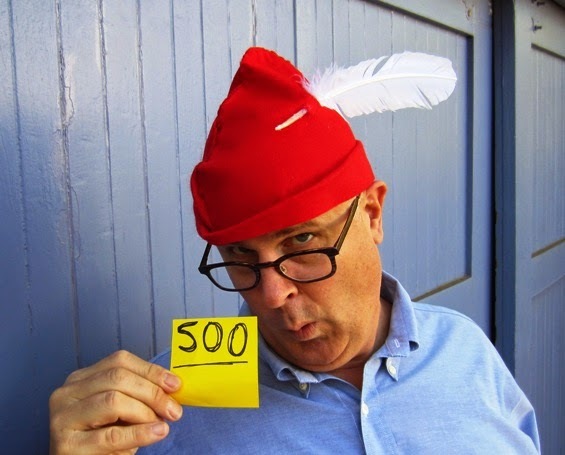 One of the things I discovered this evening is that the hat in question is not - technically speaking - a tam (short for tam o'shanter which is distinguished by its pompom. Before we look ahead to the end of the Project, I need to make an important correction. In my eagerness to make a basketball-related analogy to close out yesterday's installment I said it was "a full-court press to the final four." In reality it was a final five (math has never been my strong suit). So it's as of today that there only four days left before the last lid goes live. Sometimes when I think about the end of the Project I'm all "Irie man," about it. Other times I feel a little, well, dread. And not the 100% synthetic black fiber kind either. Day 495 / Hat 495: Wool, baseball-style cap in yellow (aka Los Angeles Lakers gold) with stylized purple Lakers logo consisting of a capital letter L over top of basketball embroidered on front. Additional details include purple button on top of crown, purple contrast stitched eyelets, purple Nike Swoosh on left side of crown near the brim, and an adjustable Velcro closure in back with the word "Lakers" embroidered in purple. Interior tags include red, white and blue NBA logo and red, white and gray Nike Team logo. Oh, did we mention it happens to have been autographed by Kobe Bryant in black marker on the left side of the brim right next to a holographic authenticity label sticker which also bears the NBA logo. This hat, which I believe the Bride won at a Los Angeles Lakers' charity fundraiser some years back, has been living in a Ziploc bag in the Garlodge for for at least as long as we've had the Garlodge. 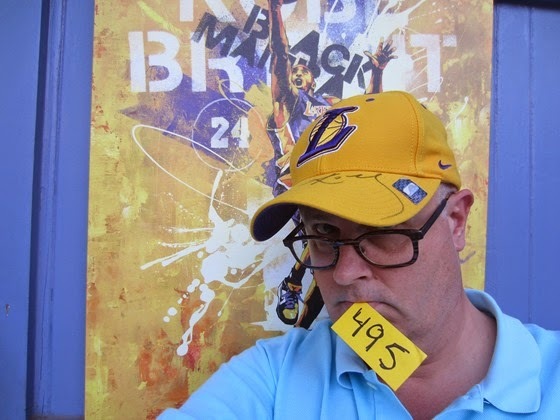 And, while certainly not the most visually stunning of the hats to date -- and far from the only Lakers lid in the mix -- it is certainly the only autographed piece of headgear, and I would've have been remiss in my duties if I didn't throw this hat in the ring before the whole thing was over. And now? A full-court press to the final four! Day 494 / Hat 494: Pink, wool felt western-style hat with 3 1/8-inch brim, five-inch crown and half-inch center crease. Additional details include 2/4-inch white grosgrain hatband detail tied into a simple knot one one side, black leather interior hatband with tag that reads: ""WPL5923, 100% wool, X-Large, made in USA." "Strong, reliable, and independent like a true cowgirl on the range, the Eddy Bros Kid's Ranger is a very cool western for that youngster in your life. This wool cowgirl hat from Eddy Brothers will make your little cowgirl look like the darling of the rodeo. A classic Cattleman Jr. crown and sturdy 3 1/8 inch brim will make any child feel like a real western ranger, riding horseback through the old west. Your little girl can wear this western selection to that corral, rodeo, or bull riding event and fit right in. The Ranger presents a classic cattleman shape at an incredibly affordable price!" Went I was hat grubbing in the Bride's closet and came across this cowgirl confection (which almost surely was purchased during a visit to El Paso, Texas, though she's not here to provide the proper provenance), I was almost positive it's already made an appearance in the Project. But, not wanting a #HATFAIL so close to the finish line, I looked high and low. I've featured plenty of western hats to be sure and a goodly number of pink pieces of headgear. 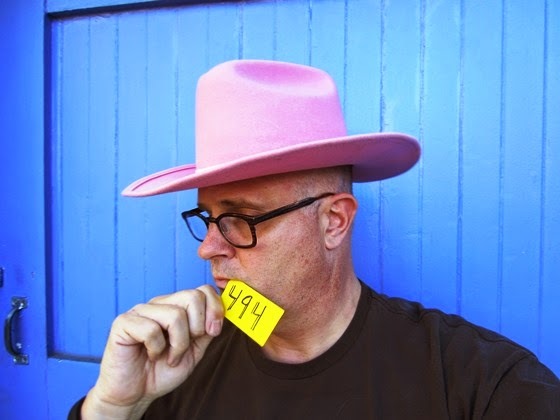 And yes, I've even featured a pink cowboy hat -- albeit a pint-sized, glitter-covered one (PC 328). but nowhere did I find evidence that this critter had been featured. Oh, and that pose in the above photo? I call that looking off to the right and down slightly the "pensive cowboy." I think it makes me look like I'm ruminating on all cowboy stuff -- lost calves, upcoming rodeos, where I left my winter horseshoes. Now, from the saddle I'm sittin' in, it it appears I've got a six-pack of hats left to rustle up before I can hit the bunkhouse. Day 493 / Hat 493: Yellow, red and orange stylized flame-shaped headpiece composed of 95% polyfoam and 5% plastic. The plastic part is a small battery-powered contraption that's supposed to light up some part of the fireball but I'm not sure exactly which part since I was kinda moving fast on to get this stealth snap. "Light up the room—literally—in this blazing Chris March Light-Up Flame Wig. Made of durable, lightweight foam, this sky-high flame wig feels comfy and cool while making you look hot hot hot. With light-up features, this scorching headpiece in red, orange and yellow is the perfect topper to your unforgettable Halloween costume, whether you go as a big-time firefighter or a clumsy flame-throwing hibachi chef. One size fits most." Given that I'm prone to impulsivity and the occasional temper flare, I thought it appropriate. But you know what they say -- leaving a flame unattended for too long is never a good idea.